One day after Leesburg’s newest Town Council member was sworn in, there is another vacancy to fill on the dais. 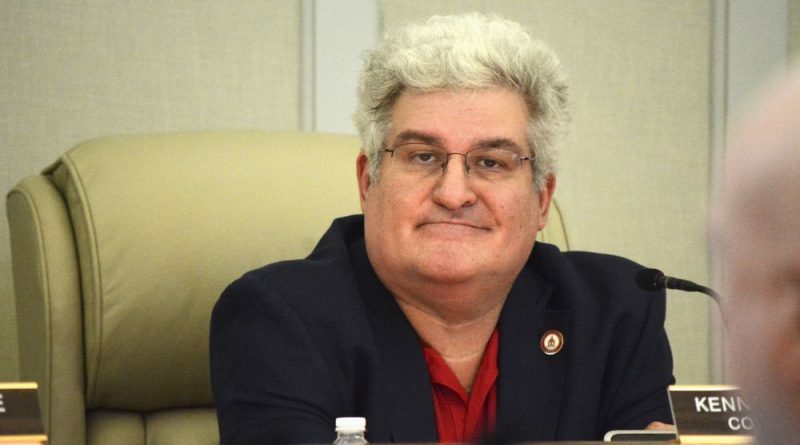 Councilman Ken Reid submitted his resignation letter Tuesday afternoon, in an email to his fellow council members and Clerk of the Council Eileen Boeing. Loudoun Now received a copy of the email following a FOIA request. In the letter, Reid notes that among the reasons he is resigning is a job opportunity in Hampton Roads that will take him out of town on a regular basis. His resignation is effective Dec. 1. The email also states that he will retain his residence and publishing business in the town, though he called the latter a now part-time endeavor. Reid also said he has tendered his resignation to the county’s Transit Advisory Board and the Metropolitan Washington Council of Governments Region Forward Coalition. It’s a surprise announcement from a longtime political figure in the town. Reid was first elected to the Town Council in 2006 and won re-election in 2010. In 2011, he upset incumbent Kelly Burk to secure the Leesburg District seat on the Board of Supervisors. He did not seek re-election. Following a one-year hiatus from elected office, Reid was the top vote-getter in November 2016’s Town Council elections, and began serving a new four-year term Jan. 1. Now, three years remain on his term and it will be up to the council to determine how to fill his seat. “I am grateful to the voters of Leesburg for the honor of electing me three times to the Town Council and once as Leesburg District supervisor. I am hopeful the citizens of Leesburg will elect a great replacement to serve out the remaining three years of my term,” the email reads. According to the email, Reid is not expected to be at tonight’s council meeting. He also did not attend Monday’s work session. He could attend two more council meetings prior to the effective date of his resignation, as the council holds its next set of bimonthly meetings Nov. 27 and 28. Attempts to reach Reid Tuesday were unsuccessful. Sorry to see Ken Reid go as he gave a fiscally-responsible balance to a council that is following the rest of Northern Virginia in its “tax and spend” left-leaning ways. It says: “Among the reasons?” What were those reasons? Maybe dealing with a dumb bunch of council people. i find it hard to believe someone cannot find a job in Northern Virginia. After being the swing vote on the fiscal nightmare of the Silver Line Metro, casting this county into probable bankruptcy, Ken Reid slinks off into the night, leaving us holding the bag. Shame on you, Ken Reid. While he will most likely be notoriously remembered for the vote that committed Loudoun to finance the metro system, I will always remember Ken as the elected republican most likely to show up to help the party. Ken was a fixture at committee meetings and was always helping someone get elected (locally, state or federal). He was a good team player. Good luck, Ken. Agree with Lawgh on something. At the Planning and Town Council Meeting, The Economic Development Steering Committee discussed their 100+ page report. As part of the report, I wish they had taken time to interview average citizens, like myself, as well as themselves and primarily long-term business Owners. A similar occurrence happened many years ago, when the Town Council spent $400,000 on Architectural Fees, and didn’t consider asking a few residents in the Apartments down the street from Westpark Golf Course about the proposed pedestrian trails and bridge across Route 7. When the residents found out, the project was dissolved, and the $400,000 was forever lost, sadly. In regards to the Report, some brief comments are noted below. I implore my Mayor and Town Council to question the Steering Committee’s motives for the following. When is it ever, and I mean ever, a consideration for Two Planning Commissioners or Two Town Council Members to concern themselves with the profitability of Developers!?!?!?!?!?!? “A fast track program should be implemented for land development application reviews, she said, noting that dragging out the process is costing developers more money”………. Costing developers more money…… Hummm……. Imagine that, my Town Council Members, Planning Commissioners, and Economic Development Commissioner worried about DEVELOPERS making MORE MONEY…….. There seems to be three (smaller) primary and outspoken downtown developers who have voiced their issues at a previous Town Council Meeting and through a newspaper. They continue to put pressure, pressure, pressure, on my Mayor and Town Council about SPEEDING up development. I get that Folks in certain departments may be archaic, but let’s fix that, and if that equates to hiring someone, or firing someone, then just say it…… Much of the work is very, very mundane and takes time in order to be precise as you are dealing with the downtown area, which takes consideration. It seems the Developers want their cake and eat it too, aside from the one larger developer who seems to understand the financial, technical, and emotional processes involved. With that being said above, The Committee wants to “do away with” the Payment in Lieu for Parking, which is in direct contrast with that of the Town Parking Consultant. This ties into the development cited above and would give developers another freebie of about $6,000 per parking space (could equate to multiple 6K per each residence) that they cannot provide at the building under renovation. This concession, especially for smaller dwellings is utterly mind-boggling and beyond comprehension how anyone would concede this payment when it would place this financial burden on The Citizens of The Town of Leesburg moving forward. To make a point, a condominium charges each resident X amount of dollars starting on Day 1 that a brand new roof is installed. The new roof is guaranteed to last for 20 years, so each resident pays into their share based upon the agreed upon time frame (quarterly/yearly). If you move out at year 10, or someone moves in at year 10, nobody in essence, gets harmed financially by a 10-year old roof. For the In Lieu of Payment, it is a guarantee that OUR garage(s) is a substitute for the parking, which Ron Campbell, Marty Martinez, etc. and probably the likes of Kelly Burk have zero financial sensibility…….. This is my personal business and the business of the Garage Consultant who recommended the correct decision. If You opt to do away with the In Lieu Payment, you are in essence, not performing your Fiduciary Responsibility with Tax Payer Money. “and you and worried about Developers making more money” as stated by Ms. Babbin…………….. What you need to truly understand it that after 10-20, each garage repair project can cost millions of dollars, and who foots the bill, not the developers who were given a freebie pass by the Mayor and The Town Council, but the taxpayers. By then, if this gets pushed through, and anyone who touched this is still around, and I get taxed one penny, it will come back to haunt you. Ironically, Nothing cited about the Leesburg Airport and the net net zero profit that has been on the taxpayers of Leesburg for decades while the 1%’ers get to use it at our expense. The Airport benefits the entire County and not just the Town…… Kelly, Ron and Marty are intent on educating the public that the Airport is here to benefit YOU. You pay taxes on it even though YOU never use it. In the upcoming years, they want to build more hangars, and they don’t know how to pay for them. The Steering Committee has come up with some creative ways, and the Town Council is supposed to be talking to the County, but I feel it is a dog and pony show. Who knows, but only time will show. I suspect that tax payers will be fleeced once again, as always. The Airport belongs in the hands of the County!!!!! Kelly, Ron, Marty have a Fiduciary Responsibility to Leesburg, so let’s see how they handle this one…. Probable part and parcel as it’s not their own money….